Looking for a tasteful, elegant space to host your next event? Look no further than our beautiful, newly-renovated hall, “The Dove”. Its soaring ceilings, topped with handsome wood arches, create a spacious, open feeling to the room. The neutral Tuscan-inspired color-scheme will accent any décor you choose for your event. Several large bronze chandeliers provide abundant light for a glowing atmosphere. Whether using the hall during the day, with side light windows ushering in natural light, or in the evening with its softly lit wall sconces, “The Dove” sets the stage for a successful event. Speaking of stages; the hall boasts a raised dais to highlight your entertainment or speaker, or for use as a head-table area to seat the bridal party/guest of honor. With its own entrance under a covered portico, “The Dove’s” entryway is perfect in case of inclement weather and is step-free and handicapped accessible. 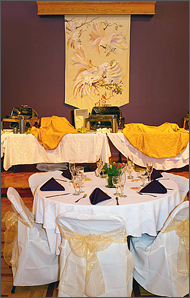 Whether your banquet is catered or home-cooked, we also have a large fully-equipped kitchen which can be utilized to prepare/reheat/serve a full meal onsite or, for use by caterers. If you require space for a pre-reception cocktail party or to host a smaller event, please inquire about our “Entry Hall” which, with ample natural light and view of our “Sanctuary’s” outstanding custom stained glass windows, is perfect for more intimate gatherings. Our lovely outdoor garden is ideal for photo ops. We also have ample parking and are convenient to Routes 78 and 22 as well as several hotels, restaurants and shops within a few miles. Whether it be a party or reception, funeral or baptism, the Church of the Holy Spirit’s gracious social halls can meet your needs. Kindly contact our Church Office to inquire about space availability or to request a tour at: support@churchholyspirit.net or call 908-236-6301.